Do our eyes deceive us? 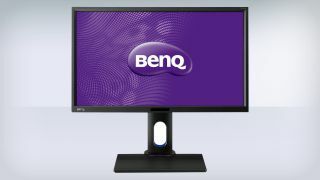 Apparently not: a 24-inch QHD monitor really has landed on the market, and it comes courtesy of Taiwanese monitor maker BenQ. The BL2420PT has a 2560 x 1440 pixel-resolution, a common feature on 27-inch (and above) displays, but few (if any) companies have taken the resolution to 24-inch territory before. Aimed at professionals in CAD/CAM, animation, video editing and graphic arts, the monitor offers a 77% larger working area compared to full-HD screens. Professionals will also be interested in BenQ's claim that it covers 100% of the sRGB space, something we're keen to check with our trusty colour calibrator. Who's briging 16:10 back in fashion? Specs-wise, the BL2420PT has an IPS display with 178-degree viewing angles and a brightness of 300 nits, 1000:1 native contrast ratio, 20M:1 dynamic contrast ratio and 14ms (5ms grey-to-grey) response time. Connectivity includes D-sub, dual-link DVI, DisplayPort 1.2, HDMI v1.4, a headphone jack, line-in and two 1W integrated speakers. Other features include an adjustable height stand, optional VESA wall mount and CAD/CAM and animation modes, in addition to BenQ's eye strain-reducing Flicker Free and Senseye 3 technology. We're still waiting for information on pricing and availability, so stay tuned.